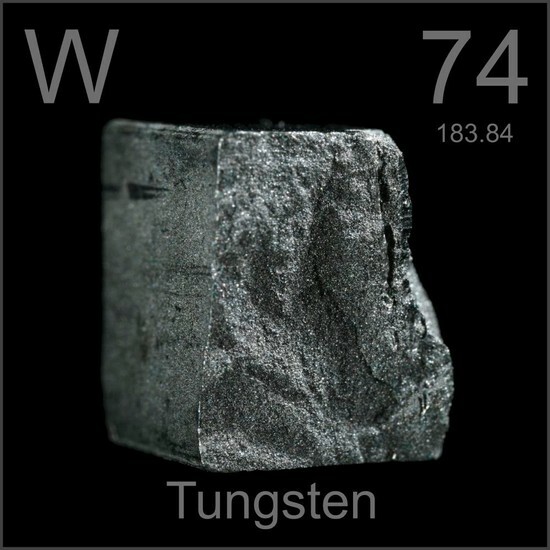 History:Discovered by Fausto and Juan Jose de Elhuyar in 1783 at Spain, from the Swedish words "Tung sten" meaning "heavy stone"
Uses:Tungsten is found in wolframite (iron-manganese tungstate, FeWO4/MnWO4) and scheelitez (calcium tungstate, CaWO4) ores. China produces 75% of the world's tungsten. Interesting Facts:The highest melting point and lowest vapor pressure of all metals, and at temperatures over 1650°C has the highest tensile strength.